Though the average consumer may not know this, there is a significant debate about whether fluoride is good for teeth, and particularly whether it is good for the bodies attached to those teeth. There are highly educated, sincere individuals on both sides of this argument. The American Dental Association is firmly on the side that fluoride is good for teeth, and harmless to people. On their website fluoridedebate.com, they state that at current water fluoridation levels, fluoride “is not toxic according to generally accepted scientific knowledge.” They further state that numerous studies have been done and “No charge against the benefits and safety of fluoridation has ever been substantiated by generally accepted scientific knowledge.” Most dentists, trained and certified by the ADA, agree with this “generally accepted scientific knowledge.” They will point out to you that fluoride can re-calcify tooth enamel, even when applied to teeth that are beginning to soften/decay. 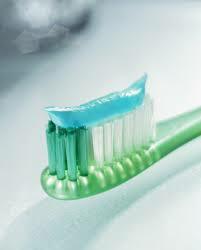 Fluoride is the daily armor, and the last defense, for ADA dentists. On the other side of the debate, scientists point to studies which link fluoride consumption (whether from water, foods, toothpaste, supplements, and increasing levels in irrigated farmlands) to many illnesses, including alergies, arthritis, low IQ, cancer, and diseases of the brain, bones, thyroid, pineal gland, immune system, kidneys, and reproductive system. Check the Health Effects page of the Fluoride Action Network’s site to read more in depth about the studies which link these illnesses to fluoride. If you check back on the fluoridedebate.com site, you can find that some scientists find that the data is open to other conclusions, or find problems with the data itself, such as lack of controls. Up until the 1970s, European doctors used fluoride as a thyroid-suppressing medication for patients with HYPER-thyroidism (over-active thyroid). Fluoride was utilized because it was found to be effective at reducing the activity of the thyroid gland – even at doses as low as 2 mg/day (a common total consumption level for those drinking fluoridated water). There is concern that current fluoride exposures may be playing a role in the widespread incidence of HYPO-thyroidism (under-active thyroid) in the U.S. (From http://www.fluoridealert.org/health/) Since Hypothyroidism runs in my family, and I am currently being treated for this condition, I have decided to avoid fluoride completely for myself and my family. In reading through arguments on both sides of the debate, I find that the best the ADA can come up with is to question the methods of study, point to studies which were funded by those making a profit from the sale of silicofluorides, and to state that fluoride safety is just “accepted scientific fact.” I look at this as a grand cover up . . . after all, what kind of liability would the ADA have for so many health problems, potentially even thousands of deaths, were they to face the facts in regards to the health effects of fluoride? OK, so at this depressing point, I’m pretty ready for some good news. And we do have it. Xylitol, a natural sugar, even produced by our own bodies, can do that same amazing thing that fluoride can do: re-calcify tooth enamel. It tastes great (it’s a natural sugar, for crying out loud), and it’s easy to get into our diets: toothpaste, mints, gum. Speaking of gum, studies consistently find that school children who are given Xylitol gum to chew reduce their incidence of cavaties, even if their other dental health habits are poor or non-existent.